If you’ve ever learned a foreign language, you know that some words in other languages sound like inappropriate or funny things in your native language. We giggle, we move on, or in the cases of us less mature people, we never move on. It just sits there at the back of our minds waiting for the chance to make it’s reappearance when we’re bored and need a laugh (or, in some cases, at inappropriate times). The most recent occurrence of this inadvertent hilarity, was when I was reading a book to my class called “Squanto, the Pilgrims’ Friend.” Since Thanksgiving is quickly approaching in the US, I decided to teach a little bit about the first Thanksgiving and the friendship between some Native Americans and the Pilgrims. When I first read the title of the book, the tell-tale round of giggles, whispers, and laughter tipped me off to my faux pas. After a few minutes of this laughter and my apparent confusion, my co-teacher came to my rescue and told me that Sqaunto sounds like the Chinese for “bald man.” I thought it was pretty funny so I gave the students a couple minutes to get their giggles out, but to no avail. The whole rest of the class, whenever I read Squanto, the whole class burst into laughter again. It was funny, but not THAT funny! Moral of the story: when kids think something’s funny, that’s all they’ll be thinking about for the next 40 minutes or so, so if you can’t beat ’em, join ’em! 119 of course! We are in Taiwan after all. Wednesday was field trip day, and we went with the 2nd grade to visit the Fire Station! I have to admit, I was really excited about this excursion, just imagine all the possibilities! Climbing ladders, spraying the water hose, sitting in the fire engine, it all seems so much fun! I was so excited I even contemplated putting black spots on Bai so I could pretend he was a fire house Dalmatian, but Nick wouldn’t let me. 😦 Oh well. In the midst of our busy week, I had forgotten all about the field trip to the Fire Station, but I woke up Wednesday morning with lots of excitement! It’s a good thing I’m not a dog, or I would’ve had an accident. 😛 The first activity of the day was riding the elevator up to the sixth floor to listen to a presentation from the Fire Fighters. This was enough excitement for the kids, you’d think they’ve never ridden in an elevator before by all the oohs and ahhs. After the presentation, the real fun began! The kids rotated through some stations like riding the bucket, spraying the hose, getting in the ambulance, and sitting in the fire truck. They were having so much fun! Being foreigners kind of gives you instant celebrity here in Taiwan, and we got another taste of that at the Fire Station. The fire fighters let us spray the hose all by ourselves, ride up high in the bucket, and try on the fire fighter uniform. 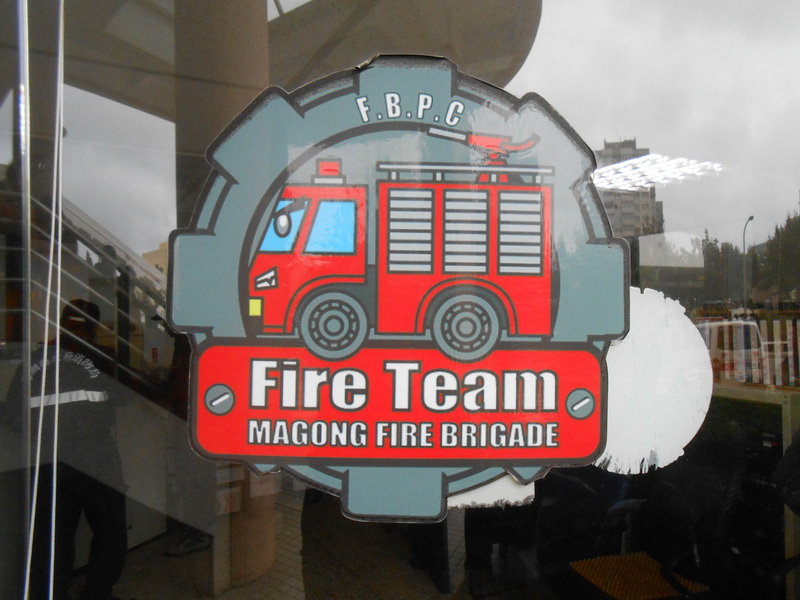 They even made us honorary fire fighters by giving us each an official Magong Fire Brigade patch!!! 😀 It was so much fun! 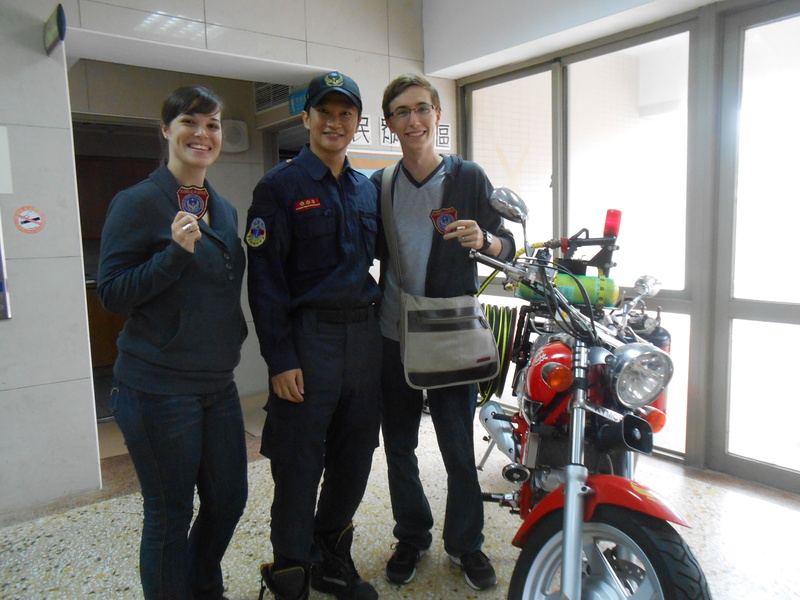 Us with our official Magong Fire Brigade patches and new fire fighter friend! This is a fire bike! They can take it to remote places to fight fires. Afterwards, we all went to the park across the street where the students ate and ate and ate all their snacks from home. Those little kids can really pack it away! He wanted to tell me secrets! It was basically a string of all the English words he knew. No sentences were involved. It’s November!! I can’t believe how fast time has gone by. It seems I say this every year, but time just always slips away. Why is that? I guess we should just be reminded to enjoy our lives and be content with what God has given us now. You know, Carpe Diem, or live in the moment, or YOLO, or whatever it is that motivates you to enjoy the time you have, since we’re not guaranteed tomorrow. Onto Halloween! Our school always throws a big shebang every year for Halloween, and this year was just as much fun as ever. We had a costume contest (with some great costumes), made play doh for a scary monster sculpting event, and gave out lots of candy! Halloween normally sneaks up on Nick and me like a ghost. We usually don’t start planning our costumes until Halloween is a week away, and by then it’s too late to be very creative, but this year was different! Maybe it’s the fact that we were teaching Halloween for the four weeks prior to the actual holiday, or the plethora of costume ideas online, but whatever it was, we couldn’t forget that Halloween was coming. We started planning our costumes a couple weeks into October, and we got pretty excited about it! I was a pirate, and Nick was (for lack of a better title) a cardboard man. I think this year has set a precedent for our Halloween costumes every year, we really have to step up our game from now on because now we realize it’s fun! This week I was supposed to go teach on a little island called Wang-An (read about my previous teaching adventures in Wang-An here). I was all set for my week in isolation. I had my iPad stocked with movies, my nook loaded with the new book I’ve been wanting to read, and my bag stacked with snacks to fill the lonely nights. This may sound a little ridiculous, but ask any foreign teacher in Penghu who’s done their week of island teaching, and you’ll find out that there isn’t much to do. Most of the islands don’t even have a 7-11 (that’s a cry for help right there :P)! I arrived Tuesday morning all ready to set out. 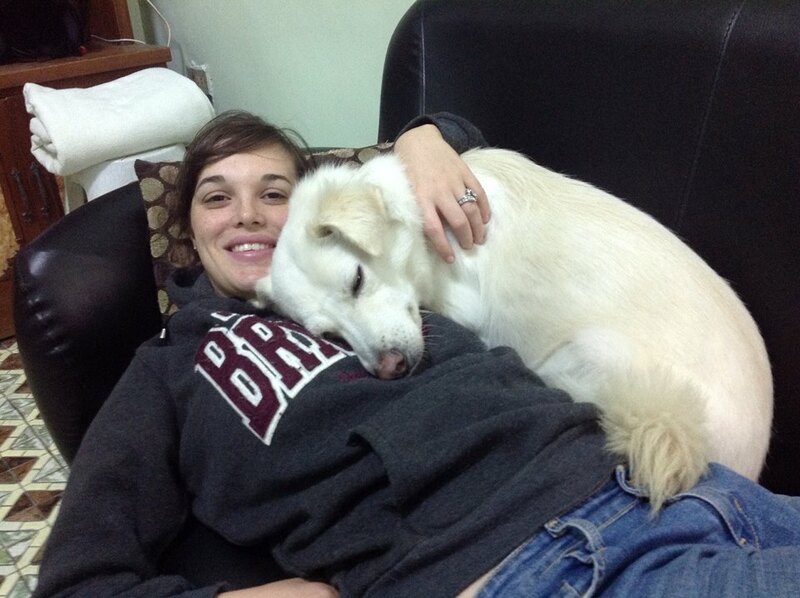 I had given the dogs and Nick hearty goodbyes, and was setting out with my co-worker to catch the boat to Wang-An. We arrived at the port and to my excitement disappointment, we were told the boat wasn’t running today because of the weather. Living in Penghu, everyone knows that everything depends on the wind on that particular day, and I guess Tuesday’s wind was just too strong for the boat to brave. Darn! 😛 We returned to school with the sad thought that I would be staying in Magong all week. Shucks! Unfortunately Fortunately, there was another boat that would make the journey in the afternoon. Yippee! After spending the morning being very unproductive productive, we set out again for the port. When we arrived at the port, the boat was sailing away! Boo! Apparently no one told us that the boat sometimes leaves early, and sometimes leaves late, but hardly ever on time. Who knew?! So as we waved to the people on the boat, I settled into the sad happy reality that I would be staying in Magong with Nick and the pups all week!